This study examines the conversion of CO2 from biogas into microalgal biomass during photosynthetic biogas upgrading. In this process, CO2 is separated from biogas by microalgae, which use the CO2 for photosynthesis. 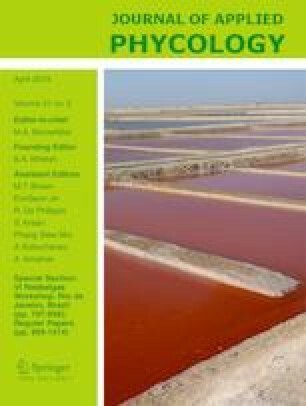 However, the conversion of biogas C into biomass of individual microalgal species is still not fully understood. Therefore, Chlorella vulgaris, Chloroparva pannonica, Synechococcus cedrorum, Synechocystis minuscula and Spirulina laxissima were screened for growth in C-limited media. Secondly, algal biomass was produced in C-limited media at bench-scale. Subsequently, two of these cultures were treated with biogas and the biogas CO2 fixation rates as well as several growth parameters were determined. C. vulgaris and C. pannonica grew well during the screening. During the following biomass production, the cultures grew at rates of 0.42 and 0.48 day−1, respectively. After biogas treatment, the increases in cell growth, biomass and organic carbon of C. vulgaris were significantly higher than in the controls. In contrast, the growth of biogas-treated C. pannonica cultures did not differ from their controls. Thus, the accumulation of biogas C in microalgae is species-specific. The measurements of carbon in biomass of individual algal species proved to be inevitable to determine exact CO2 fixation rates. The CO2 fixation of 1.0 g per formed g C. vulgaris was lower compared to other biogas upgrading studies with photosynthetic microalgae. Ultimately, the introduced species-specific approach helps to prevent the misinterpretation of CO2 fixation rates during photosynthetic biogas upgrading as well as the enhanced biological carbon fixation with phototrophic microalgae. This study was financially supported by the Ministry of Education, Science and Culture Mecklenburg-Western Pomerania, Germany.